Rise of the Empire carries on! I'm NOT through with my Rise of the Empire series by a long shot but I thought I'd mixthings up a little bit with some WIP clone commandos that I'm working on. NONE of these dudes are finished yet but they're getting close. They all need decals, and finish detail painting and weathering. I hope that you enjoy this update of commandos. I'm having lots of fun making htem. 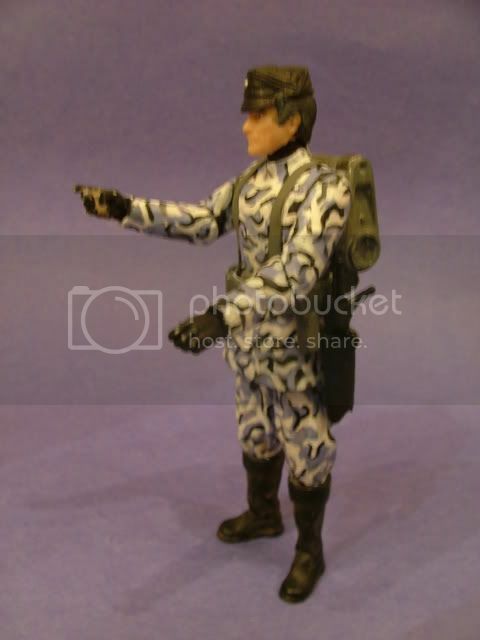 This first series of pics details the weapon and pack of commando #2. This figure is named Domi (after my middle name Dominic) He's really into rockets and he carries a barrage of interchangeable rockets for his modified weapon. These rockets are all tot ally interchangeale between the rifle and the pack storage area. I hope that you like this but let me know what you think. The second set of pics details a grappling hook fitting for Clone #3's rifle. His name is Tambo...those of you who know me may understand this reference. This grappling hook attatchment was very difficult. I wa able to make it so that the line actually rolls off of the spool and throught the hollowed out barrell. It can wind back up onto the spool by simply rolling the spool in reverse. Please let me know your thoughts and feedback about this as well. Here's a proposed Republic Commando design basically finished except for detailing the clone head and some more weathering. 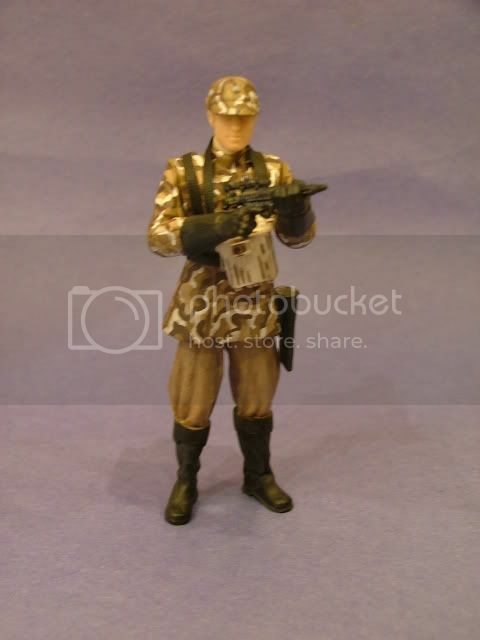 This is sort of a break away from many other commando's that I've seen so hopefully it will be a hit with DA. By the way Steve, if you don't like it I'm totally cool with it. Let me know and we'll do something else nor prob...Let me know what y'all think of it. Here's a few pics of a Republic Commando side project that I'm working on. These are NOT part of the ROTE line but I'm sure that they were busy at the time of order 66. I'd like to do some customized gear and here's some pics of the early weapons and gear. Here's a figure that I recently made for a series of figures that I've been working on for a few months. The figure series is known as Rise of the Empire and its set a between ROTS and ANH. First up is Imperial trooper. Let me be the first second to welcome you here! That really is a nice looking Custom. It tool me a second to figure out what head that was. You disguise Antillies very nicely. The homemade holster looks great too. And the part choice is excellent, it is nice to see a little variation from any one particular imperial body we have been given. I do have one suggestion, which really doesn't even have to do with the custom, and that is to give him an E-11 as opposed to the Rebel blaster he has. I look forward to seeing you around the boards! Thanks so much for the welcome. Its great to be here. I can't help myself...I prefer the rebel blaster to the imperial verison. Its true- it should be the E11 but I tried to sneak my preferred blaster in there. When his new helmet arrives I'll take pics with the correct blaster! Welcome aboard! I think you'll find the JD crew quite the good customizing family. Your imperial looks tremendous. I like what you've done with that head repaint. There's no realy policy but most peole have their own thread just becasue it is nice to see all of someone's work in one location. Hey man, glad you accepted my invite! Welcome to JD! Here's the first figure in a custom series that I call: Rise of the Empire. Major Veers. THis figure was inspired by events that take place 0-3 years after ROTS. 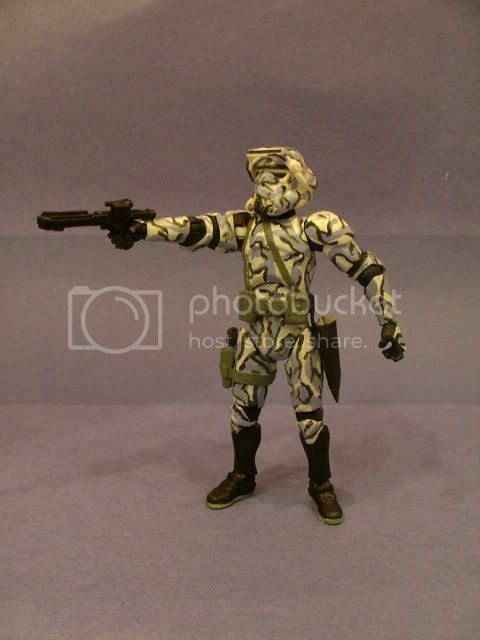 Major Veers is in urban Camo for combat on the Twi'lek home world of Ryloth. Please let me know what you think good, bad or indifferent. Thanks for looking. I like all these customs very much, they are fresh and unique. They have a certain "national socialist" look and feel to them ( ) , the uniforms looks awesome there is no denying that. Great use of fabrics and leathers to pull of this batch of customs. As I said, I have loved everyone of your customs, especially the Han. Do you use the covers on those cheap binders for your holsters? lol, yeah its the same vinyl stuff your using, only thing is you just gotta peal it of of the binders, its the ones with the cardboard on the inside, and the vinyl stuff covering it. They cost like 99 cents, and the trim of the binder works good for the body suit around a persons neck. I've seen your work at scum before, welcome to this place too, your work is outstanding. Such great details! I really like the detention block officer - so professional - what head did you use for it? And the Han is just amazing. What a great design and execution - that figure at retail would sell like crazy. I'd buy a dozen!